Mincemeat by Leonardo Lucarelli. The book is being released by Other Press on December 6, 2016. Amazon says this about the book: With the wit and pace of Anthony Bourdain, Italian chef and anthropologist Leonardo Lucarelli sketches the exhilarating life behind the closed doors of restaurants, and the unlikely work ethics of the kitchen. In Italy, five-star restaurants and celebrity chefs may seem, on the surface, a part of the landscape. In reality, the restaurant industry is as tough, cutthroat, and unforgiving as anywhere else in the world--sometimes even colluding with the shady world of organized crime. The powerful voice of Leonardo Lucarelli takes us through the underbelly of Italy's restaurant world. Lucarelli is a professional chef who for almost two decades has been roaming Italy opening restaurants, training underpaid, sometimes hopelessly incompetent sous-chefs, courting waitresses, working long hours, riding high on drugs, and cursing a culinary passion he inherited as a teenager from his hippie father. 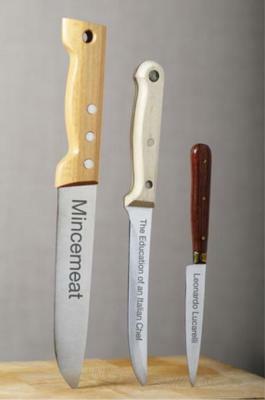 In his debut, Mincemeat: The Education of an Italian Chef, Lucarelli teaches us that even among rogues and misfits, there is a moral code in the kitchen that must, above all else, always be upheld.